The high heather moors of the British Isles start turning purple from the beginning of August and remain in flower for approximately 6 weeks. 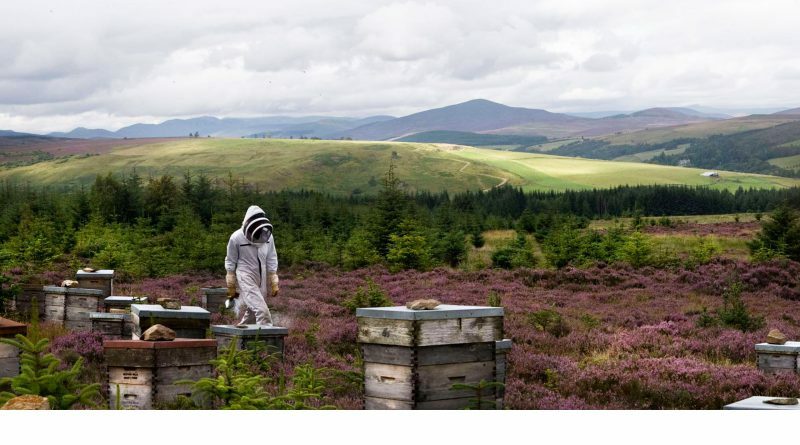 Due to the timing of this potential crop, the chance to extend the season with one of the finest honeys available in this country, those beekeepers who seek adventure (or plain daft) head out with cars/vans/trailers and optimism to seek a fortune! And so it was that a trip to David and Terry’s site in the Black Mountains was organised with Kevin and Colleen as well. It did not start well. As we were all out preparing our hives for the move on the previous evening David reported his 4×4 as refusing to start. With the prospect of having a tiny Fiat Panda towing a trailer of 8 hives to Wales, some of us were nervous. But Colleen volunteered her 4×4 and with reorganised loading plans we were back on! At 5.30am we met up at David’s (us kids were half an hour late). An uneventful trip to Wales went well and we were soon in the Forest, climbing the stone based tracks up through the trees and out to the fields of our farmer host. The field was quite steep, with long grass. With much effort Colleen got her car and trailer into the field and traversed the slopes up to the top. My car and trailer were never going to make it so I settled for a site at the bottom of the field. So, David had the high ground but there is little difference we hope for the bees as we set up our hives at the bottom of the field. I am ashamed to say that my hives were coming apart – there was a frenzy of bees (they were still mad from my interventions the night before). Quickly setting the hives up and bodging some stands as level as we could we opened the hives up and left them to it. Some of us settled for 1 super on top, others were more optimistic on what the crop would be – one year in ten is a bumper year, 2 or 3 dead losses with starving bees, the remainder just an average crop. Mid September -and we will know the answer and the adventure of packing up bees in the late evening and the return home in the dark with the prize.